Congratulations to The Ancient Mariner on 45 Years in Business! The Ancient Mariner, owned by Jessica Wilmot, is part of the fabric of our town. A gathering place after the 9th inning, Saturday lunch with the kids between soccer games, a beer with the guys (or gals), happy hour (any hour) - it's Ridgefield's own Cheers. Thanks to a shoutout today by Ridgefield Theater Barn who reminded locals that 2019 marks an important anniversary for the townie hub - 45 years in business! 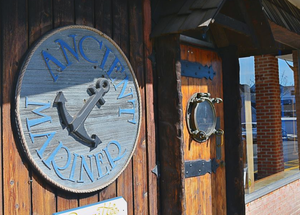 April 7, 1992, is a day owner Jessica Wilmot will never forget, it's the day The Ancient Mariner, a nautical-themed and pub-style restaurant, became hers. And, 2019, marks 27 years of that Wilmot has owned The Ancient Mariner. "The restaurant opened in January 1974 and I came to work in the fall of 78'. In 1992, the owner wanted to move to Florida, so he put the restaurant up for sale and that's when I bought it - on April 7, 1992," Wilmot says in a 2017 video. Under Wilmot's watch, the Ancient Mariner has become a destination for townies and families alike, serving their ever-popular Mariner Burger, lobster rolls, sandwiches, and so much more! The Ancient Mariner is located at 451 Main Street, in the CVS Shopping Plaza. Visit them online here. *Image courtesy of The Ancient Mariner Facebook Page.